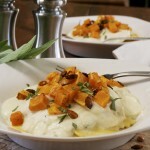 Roasted Butternut Squash Angolotti - What the "Forks" for Dinner? Roasted Butternut Squash Angolotti - What the "Forks" for Dinner? Peel butternut squash, cut in half lengthwise. Remove seeds and set aside. Cube squash to make 1 cup. Keep remaining squash for another use. Remove flesh from seeds but do not rinse. Place seeds and cubed squash in a small baking dish. Spray with cooking spray ( I use a coconut oil spray ). Roast in preheated oven until squash is tender and starting to brown. Keep an eye on the seeds they may need to be removed before the squash is done so they do not burn. Prepare Creamy Cauliflower Sauce according to recipe, adding 1 teaspoon sage after sauce has been blended. Keep sauce warm. Cook Angolotti according to package directions. Drain pasta and divide between two serving bowls. Spoon 1/2 cup sauce over each serving of pasta. Top each dish with 1/2 cup roasted squash. Garnish with remaining sage and roasted squash seeds.